Draining the swamp means ridding the federal government of career employees, according to one congressman who has introduced a bill to ease the process of firing them. 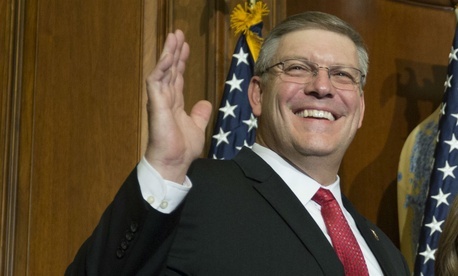 Federal employees “become where they are career bureaucrats who soak of the lifeblood of the American people,” Rep. Barry Loudermilk, R-Ga., said in a video posted to his Facebook page Wednesday. The problem, Loudermilk said, stems from the lack of attrition and accountability in the federal workforce. While administrations change, he said, the culture never does. The federal government employs one individual for every 76 citizens, Loudermilk said. Trump’s hiring freeze is a “tremendous first step” toward addressing that issue, the Georgia Republican said, but further action must be taken to deal with poor performers and misbehaving feds more quickly. Congress, he explained, can provide the pumps that put Trump’s “drain the swamp” mantra into action. Loudermilk recently introduced the Modern Employment Reform, Improvement and Transformation (MERIT) Act, which would severely cut the amount of time federal workers have to appeal a negative personnel action. It would empower agency heads to fire any employee, provided they give a notice in writing. Employees would have seven days to appeal a removal to the Merit Systems Protection Board, which would in turn have 30 days to make a final decision. If it did not rule in time, the agency’s decision would stand. Employees would not receive any pay or benefits in that interim period.